Tiptree, what’s with all the hate? You seem like an awesome person: you write rationally, you like to make jokes, you are self-critical, and you have a particular interest in politics. To me, that seems like we would have gotten along quite well and would have had many great conversations. I should confess right away that I’ve taken to reading some of your private correspondence with Ursula LeGuin and Joanna Russ. So sorry about that! What’s with all the hate? How can you go around calling people “Ay-rabs,” single out some people because of their race, or others because of their religion? Were you raised this way or did some people from these groups do something to offend you? Did you support the Civil Rights movement? I suppose I’m having a difficult time reconciling the hateful things you say with some of the other messages you champion. You fiercely deplore male dominance but admit that you feel that some types of people should be oppressed. I think that you even know these things are contradictory, but you persist in doing it in your private letters. Do you think that you’re being irrational? Do you think your feelings about these kinds of people have affected your feminist beliefs? I think that I can understand many of your other thoughts, about feeling oppressed, fearing government corruption, even your blatant bellicose attitudes (to an extent). Because of this, I wish that I could sit down and talk to you in depth about your time in D.C. during the McCarthy Years or even during the Watergate Scandal. You seem to have paid close attention to politics and those things appear to have shaped your attitudes in life. All in all, it’s been a lot of fun reading your take on events as they transpired! I hope you don’t mind if I call you Tip. Because I have so many last minute event-planning type details hanging over my head, I decided to read through my own notes from my time in the archives this past summer. The best-written thing that I have come across is a letter written by James Tiptree to Joanna Russ just when they were beginning to correspond with each other. I do not think that it stands as a piece of literary genius, but think that it is amazingly well-written because it is both real and complex- I think about its content more than that of any of the other letters. Throughout his personal writings, Tiptree constantly displays intense prejudices against many ethnic groups like Arabs, Catholics, and Germans. He rants about them constantly and generally demeans them. Yet, strikingly, in a letter to Russ from 1973, Tiptree recognizes these faults and admits that he has many prejudices deeply ingrained into his character! In this letter, he laments about the oppression of friendly groups while simultaneously expressing his own guilt at oppressing certain groups in particular. This letter is like witnessing the evolution of racism to civil rights in miniature. How remarkable that Tiptree achieved a level of self-consciousness that allowed him to reflect on his own weaknesses. Usually people are never able to admit that they are wrong, let alone critically examine themselves in a negative light. Because of this demonstrated capability of self-reflection, Tiptree no longer seems to be mindlessly contributing to oppression. He has gone a step above beyond this in that he has shown that he is capable of looking at himself objectively, comprehending the wrongness of his actions, and demonstrating the ability to overcome social brainwashing. Russ Papers, in the Joanna Russ and James Tiptree correspondence found in the Special Collections & University Archives, the University of Oregon, Eugene, Oregon. See Box 10, File 26. Dated 1 September 1973. 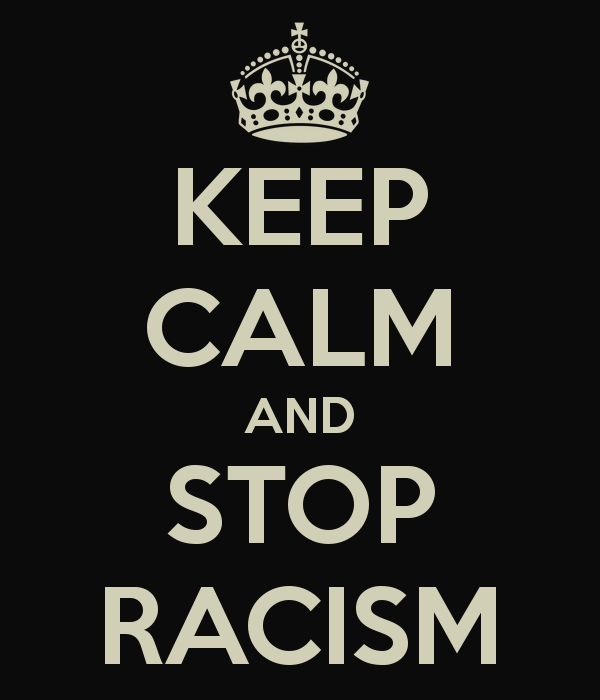 Keep Calm Picture found at <http://blackgirlsguidetoweightloss.com/wp-content/uploads/2013/03/keep-calm-and-stop-racism-19.png>. 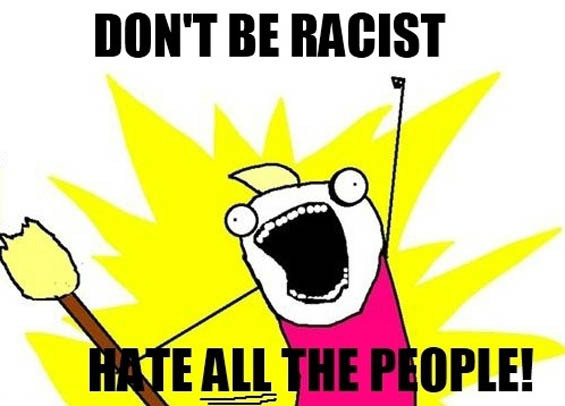 Meme found on ForkParty.com, posted by Drew, <http://www.forkparty.com/wp-content/uploads/2012/02/Say-NO-to-racism.jpg>. 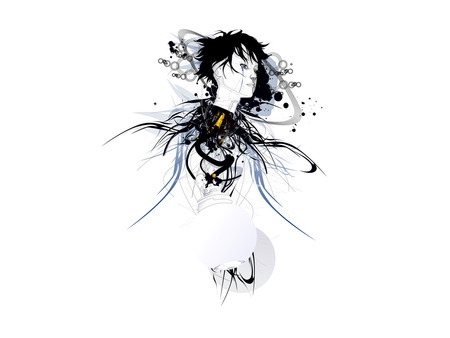 Stevenson, M. C. (2007) Trying to plug in: Posthuman cyborgs and the search for connection. Science Fiction Studies, 34-1, 87-105. She discusses Moore’s cyborg character Deidre as “superhuman” in the abandonment of her physical body, along with some other implications regarding the male gaze and political economy (she makes a similar point in regard to Tiptree’s P. Burke — saying that her identity, as well, was refracted and represented through the male perspective. A rather interesting point that Stevenson does not spend a great deal of time on). She then focuses on P. Burke as a narrative personification of Butler’s performativity, arguing that Delphi is a positive, or even progressive, example of both Hayes and Haraway’s feminist cyborg theories — she (Burke) is both free from her body and embodied at once, and is making social connections that she would otherwise not have made, thus making her more human. She concludes by viewing both characters within these theoretical frameworks as both successful and unsuccessful in different terms. She explains that both characters fall short in that they are isolated, unique beings, and therefore cannot form a community within which to make connections and interactions — the (post)humanist imperative Stevenson opens the article with.